Some of you may be aware of the forum post "Failed to characterize G3". This issue is caused by the newly implemented identification process for Daz Genesis. This identification process takes place during the auto-characterization phase for Daz Genesis characters, in which, 3DXchange recognizes the character type by the names of the bones. Since G3 and G8 characters have the same bone structure, 3DXchange version 7.2 and prior often confuses the two systems. Now version 7.21 offers a new identification process using "Body Mesh vertex amount" to assign the proper G3 and G8 profiles. The major caveat with this technique is that the some Daz content with Auto-Hide Mesh (as in the following images) will have the vertex count altered due to the hidden mesh being removed upon export. The deleted faces downsizes the vertex count, so 3DXchange fails to identify the character system and therefore will not enter the auto-convert process to non-standard setup. Anytime hide mesh is used, the problem will reoccur. We apologize for any inconvenience for this shortcoming. Out team will provide a workaround solution first by restoring the hidden mesh via a patch for 3DXchange coming out in May. 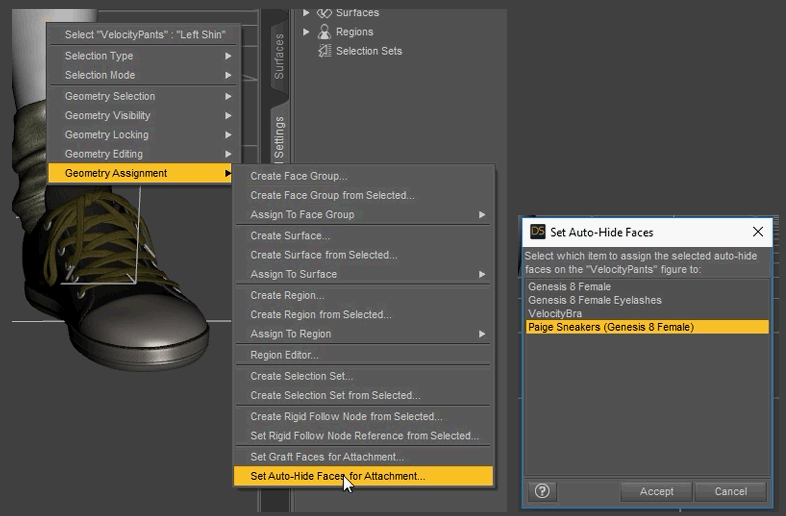 Select the body node and activate Tool Settings > Geometry Editor. 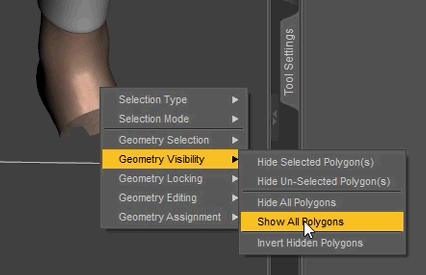 Right mouse click on the viewport and execute Geometry Visibility > Show All Polygons to unhide the polygons. 1. Replace the Auto-Hide Mesh faces with another type of mesh. Enter Geometry Editor and select any number of polygons of the pants and press the right mouse button. Perform Geometry Assignment > Set Auto-Hide Faces for Attachment... to open the Set Auto-Hide Faces dialog window. Find the shoes inside the Scene Manger and press the right mouse button. Perform Fit "Content name (target Name)" to... and select None. 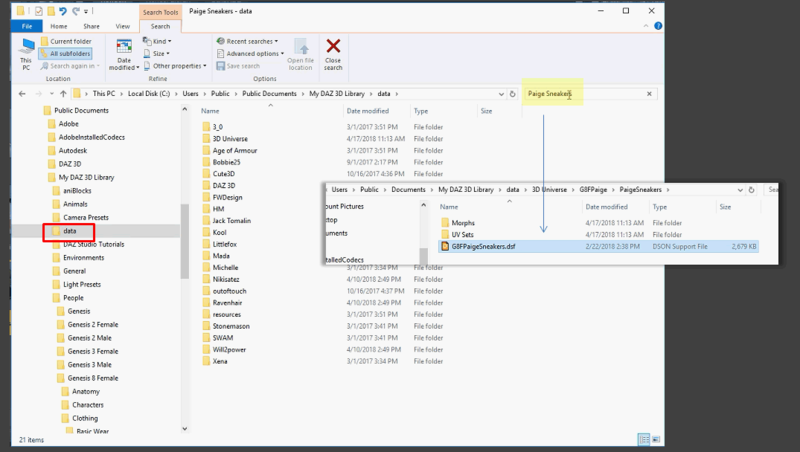 Perform the mentioned steps again, this time select Target [Body] in the Fit to dialog window. 2. Copy the name of the file. 3. 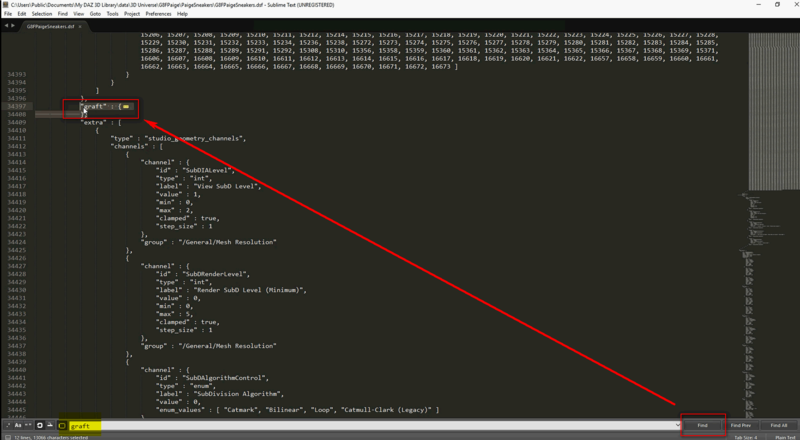 Inside the Daz data folder, search for the name that was just copied and open the (*.dsf) in a text editor. 4. Search for the word "graft" and delete the entire entry between the parenthesis. 5. Save the file as is. A backup is recommended. We need your help to collect information on Daz packs, especially those with auto-hide mesh enabled. If you have encountered an error with auto-conversion in 3DXchange, please provide us with the Daz Pack name and its link in the Daz store. It will help us tremendously in the quality control process with future versions of 3DXchange and CC3 Solo product. Question for RL or anyone else in the know. What difference does it make to an imported daz gen 8 character if it's recognised by 3dxchange as a gen 3? Perhaps it could be a good idea if say for instance we users just added Genesis_3, or Genesis_8 etc.to the name of the model at time of export to identify the type of figure it is ??? Actually that's incorrect. Genesis 8 characters were not correctly recognised in 3DXchange 7.2. Genesis 8 characters were recognised by 7.2 as Genesis 3 which led to animations being messed up unless you manually tweaked things and added the correct Genesis 8 T-Pose. As the genesis 8 eyes aren't auto mapped I add the gen 8 T-pose when setting the eyes. What else needs tweaking? Would it be possible for a genesis character 1,2,3 or 8 to be recognised by 3dxchange by adding type in it's name, e.g. Name_gen-8.fbx ? I'm not a programmer so I don't know. The above "workaround" isn't the best idea I've seen from RL. The following is by far the easiest, simplest and works . 1/ Do not install the 7.21 update. 2/ If you've already installed it.......... uninstall and reinstall 7.2. or earlier. I just installed the 7.21 patch. I hit the G* import problem immediately. How do I get back to 7.2? Please, can someone explain in simple terms the procedure?